The Boyd-Quinson Mainstage at Barrington Stage Company has been transformed into multiple New York apartments by Scenic Designer Kristen Robinson as the backdrop for one of this season’s most anticipated musicals. 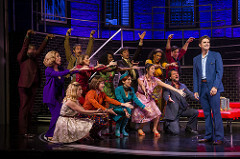 Nine exceptional musicians backed the fourteen vocal dynamos led by the very talented Aaron Tveit as Bobby, in what is generally considered Stephen Sondheim’s first major hit musical. With a book by George Furth, Sondheim’s lyrics and music epitomize the human angst that occurs in relationships, and explores the social meaning of marriage and the pressure to be married in the late 1960s, early 1970s. Director Julianne Boyd has highlighted the fun and the physicality of the characters and though downplaying what was shocking on stage when the show first appeared, like smoking marijuana or talking about a gay exploration, and has cast a multi-racial group to make up Bobby’s group of friends. This too, is not shocking—in fact, what emerges is what we see has been normalized, juxtaposed against the beauty of the story and the social pressure that advocates for conformity. Aaron Tveit performed at Barrington Stage ten years ago, and since then has gone on to star on Broadway and in the West End. His nimble voice has an impressive range and emotional depth. When he sings the iconic “Being Alive,” he sings it not an anthem. It’s a plea to the audience to experience everything, and life to the fullest. His connection to the audience is palpable and well deserving of the cheers and standing ovation. Most people either love or hate Sondheim’s work, but it was clear that this was an audience of appreciative Sondheimites (thanks Cameron, from Modern Family for introducing this word). Several people were seeing the production for a second time, and rumor has it that the show will be extended. What is also worth mentioning is how many young folks were in the audience. In a season in which so many Berkshire theatres are trying to appeal to younger patrons, this is a tribute to the infectious music and themes of this show. As we walked toward our car, one young man, probably about twelve years old, was loudly singing “Side by Side.” That was the topper on an exceptional evening of great theatre.